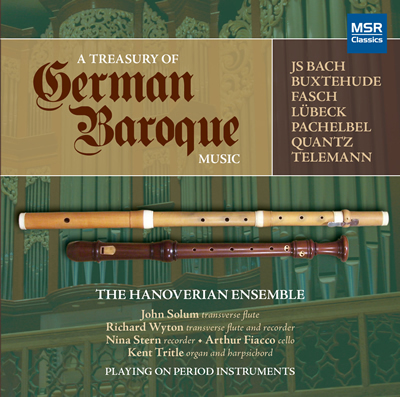 We are pleased to announce our newest release, A Treasury of German Baroque Music. A splendid gift for holiday listening, this recording was made possible by a generous grant from the Liebergesell Foundation and is now available through MSR Classics. While many classical recordings are encyclopedic, consisting of one genre by a single composer, this one is notably different, presenting a variety of works by seven different composers. The selection is based upon the instrumentation of our chamber group, featuring the versatility of Kent Tritle as both an organist and harpsichordist. The inclusion of a number of solo organ works was influenced by the hall in which we record, the Mary Anna Fox Martel Recital Hall at Vassar College, which houses a superb tracker organ by Paul Fritts. The design of this organ is based upon historic North German Baroque models. We also have chosen to include two of the handful of existing chamber works which combine the transverse flute (Querflöte) with the recorder (Blockflöte). Two outstanding flute duets, by Quantz and Telemann, round out a stylistically rich program.